Early spring sees the arrival of one of my favorite plants to forage. It's then that the first new growth of Hemerocallis fulva, the Wild Day Lily makes it's appearance. From now until late fall, nearly every part of this plant will provide us with either food, cordage or medicine. 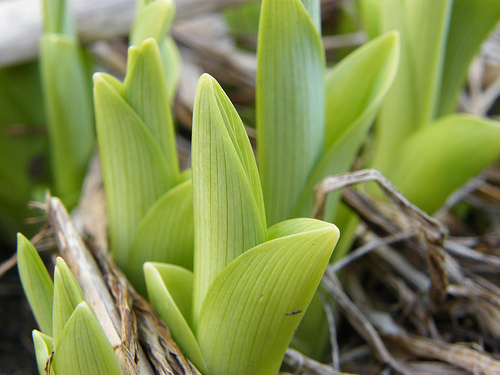 Anywhere you go on the East Coast, in ditches, road cuts, and other waste areas, thick patches of iris-like shoots and leaves will begin to magically appear. In many areas this will occur in February or even earlier if the weather is warm. Later, around June, each plant will produce a succession of bright, funnel shaped orange flowers. Hemerocallis means "Day Beauty" in Latin and, true to its name, each blossom will last only a day before beginning to wither and its beauty to fade. By early summer in my part of the country, Day Lilies are in full bloom and will remain so for the next few months. At this time there is no mistaking them for any of the poisonous iris's or other non-edible lilies. No other plant really looks similar to these unique orange blooms. Even in spring you should have no problems with identification if you will simply use a shovel to dig up a small clump of the plant and examine the root system. If you find a lot of small tubers up to an inch in length scattered among the root system, you have struck gold! If, on the other hand there are no tubers or you find just a single bulb, try again. Division is the best method of developing your own patch as they spread byAround the middle of March, begin looking for the first new growth as the plants send up masses of shoots. These can be cut up to about six inches in length. After this they become too acrid to eat in their raw state. Some of the literature states that the larger green leaves are hallucinogenic when consumed raw. Blanching or thoroughly cooking them seems to remove this property though a change or two of cooking water is a good idea. You can take small shoots under 6 inches, strip away the larger leaves, saut in a little garlic and oil, add raw to salads, or, simply steam and drench in butter for a nice, crunchy treat. After making use of the early spring shoots, the first buds of the year begin to appear. If you enjoy the taste of crunchy green beans you should have no problem here. I occasionally like to eat them raw (sort of strong) but prefer them steamed or cooked for fifteen minutes and drenched in butter or added to oriental stir fries. Like the blossoms, they can be dehydrated and added to soups and stews. This serves to intensify the flavor of anything to which they are added. I take some of the dried buds on backpacking trips to spice up bland ramen noodles and other soup type meals. Day Lily Blossoms begin appearing around the first of June, with each plant producing 15 to 50 over the next few weeks. These blossoms are a nice addition as a garnish to fresh salads imparting a sweet, refreshing flavor. Try picking some of the blossoms as they begin to wither, dehydrate and store for a taste of summer next winter when the snow is blowing and fresh veggies are a distant memory. Dehydrating the blossoms serves to intensify the flavor, almost making them too sweet for my taste. Added to soups and stews, they act as a thickening agent much like cornstarch or sassafras leaves. If you wait and add the blossoms to your soup or stew towards the end of the cooking time, they will retain their flavor, texture and appearance, adding a bit of brightness and color. Day Lily blossoms are very nutritious, containing protein, carbohydrates, iron and vitamin A, as well as Beta Carotene, vitamin C and oil. My favorite way to eat the blossoms is to simply pick them while foraging, peel away any acrid green parts and snack away. Eaten like this they taste as good as a piece of candy and are a lot more nutritious ! I also like to eat them battered and fried like squash blossoms. From late spring to late fall, hidden below ground beneath the dense mat of green foliage small crunchy tubers lie waiting to be harvested. Up to an inch in length, they remind me of miniature, smooth Jerusalem Artichokes. In fact, these two root crops can complement each other in a lot of recipes. I have used them together to make a very acceptable potato soup a few times that everyone seemed to enjoy. Try steaming or boiling the tubers as a potato substitute. 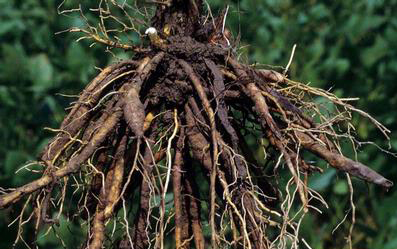 You can clean the stringy roots the tubers grow on if you want to go to the trouble but it is more trouble than they are worth. The next time you make a salad, throw a handful of tubers on top where they act as crunchy croutons adding a lot of flavor. As unlikely as it may seem, if you don't have ready access to patches of Day Lilies, you can easily grow your own private patch. While some sources state that wild Day Lilies won't usually produce seed, I don't find this to be the case in the South as a general rule. I have found that they can very easily be grown from seed. An even easier method of propagation is to go out in the late winter or early spring to an existing patch and simply divide a clump of the plants and replant them when you get back home. While the medicinal uses for Day Lilies are relatively unknown here, in the orient, particularly China and Japan, they have been utilized extensively for centuries. There they are used for cancer, arsenic poisoning, as a diuretic, for urinary tract disorders, uterine bleeding, vaginal yeast infections and as an anti-bacterial agent. A good reference to use for this is "A Barefoot Doctor's Manual." This is an excellent book on rural Chinese medicine. As the summer wears on and comes to an end, the larger leaves become very fibrous and can be used as cordage to make footwear and baskets as well as medium strength rope. Eating Day Lilies does have one word of caution attached - Due to the acrid nature of the green foliage, about one in fifty people experience nausea, diarrhea and vomiting after eating raw Lily parts. This doesn't seem to be a problem with the cooked plant however. Just exercise a bit of caution when you try them for the first time and don't go overboard gorging yourself. Once, I remember watching a television newscast in which the "roving" reporter made a trip to visit the "Day Lily King" of Alabama. This man grew many varieties of lilies on several acres and was known far and wide for his green thumb. At one point during the report, he mentioned that Day Lilies were edible, whereupon the reporter promptly began stuffing leaves and flowers in his mouth commenting on how good they tasted. As the report ended and the anchormen came back on the air, they were both laughing hysterically and explained that the reporter was still in the hospital recuperating from his visit. His face and pride had both taken a beating but as soon as his face returned to normal and the swelling went down, he would be back at work. So - take a hint and stay away from the larger uncooked leaves. 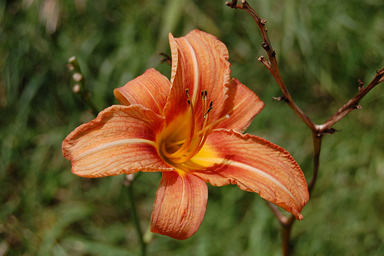 Day Lilies are one of the easiest plants for the first time forager to identify and use. There isn't much chance on making a deadly mistake. Even traveling at 55 mph down a country road, it isn't hard to identify the large clumps of light green leaves, or later, the bright orange flowers. Carry a small garden trowel or a shovel along with you and dig up a tasty treat almost year round. 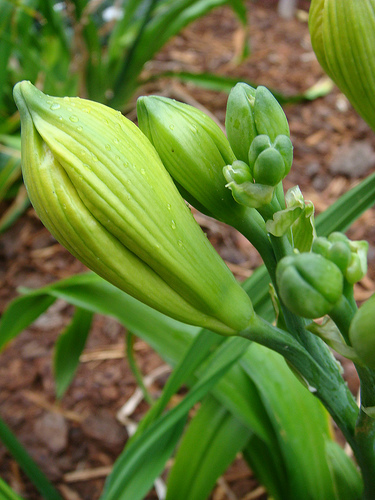 Steam daylily buds for 10-15 minutes, until tender. In a wok or heavy skillet, heat the oil until very hot. Ad the almond slivers, saute until browned. Quickly remove the almonds. Turn heat to medium. Add ginger and cook 1-2 min. add vinegar, tamari, and water.Stir to mix.Toss in daylily buds. Serve over hot rice, topped with sauteed almonds. Serves 4. STUFFED DAYLILY HORS D'OEUVRES Collect the flowers first thing in the morning. Remove stamens, trim & wash the bloom. Put in the fridge until ready to use. Stella D'Oro tastes like sweet lettuce. Just before serving fill each blossom and place upright in a beautiufl serving dish. 1 cup of diced cooked chicken, 1/4 cup mayonnaise, 1-3 oz pkg cream cheese (softened), 1/4 cup diced celery , 1/2 tsp lemon zest, 2 tsp ranch dressing.Mix well. Fills 8 large or 12 small daylily blossoms. Mix well. Fills approximately 8 large or 12 small daylily blossoms. Pick several medium-sized daylily flowers in the morning. Wash them, remove the stamen & refrigerate in a covered bowl. When you are ready for dessert, place each daylily flower in a goblet. Fill the flowers with raspberries and cream, sherbet or ice cream. Top with a sprig of mint or a few Johnny-jump-up flowers. These recipes were gleaned from various sources. Use your imagination with these versatile flowers. There are many recipes in which they can be used.